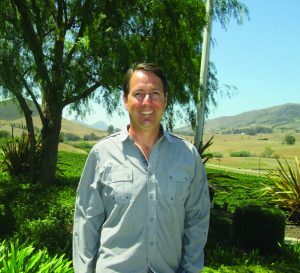 John H. Niven, vice president of sales and marketing for the Niven Family Wine Estates in Edna Valley. The temperature was just 77 degrees on a July afternoon when I visited Niven Family Wine Estates in Edna Valley, the coolest wine appellation in California, according to a Southern Oregon University study. The family’s 1,000-plus-acre Paragon Vineyard is just four and a half miles inland from Pismo Beach. The cooling ocean breezes make for a long growing season especially suited to white wine grapes of crisp acidity. The Niven family has been farming Paragon since 1973, when Jack Niven planted 547 acres, one of the first two vineyards in the valley, on land he bought with wife Catherine. Management has passed to the second and third generations, and the business evolved from a grape supplier to a partner with large winemaking corporations (Edna Valley Vineyard) and then to an estate winery with six brands, sourced almost entirely from Paragon. The family’s winery, Orcutt Road Cellars, makes about 126,000 cases a year, placing it among the top half dozen producers in the Tri-Counties. Carrying the business into four decades has advantages, not the least being ownership of the land at a fraction of the cost of acquiring coastal property today. Christian Roguenant, who has been winemaker for 17 years, said much has been learned over time about selecting the best rootstocks, trellising systems and sun exposure for each varietal. James Niven, son of Jack and Catherine, is CEO and his brother, John R. Niven, is chief operating and chief financial officer. Michael Blaney, grandson of the founders, is vice president of operations. He was in real estate in the Bay Area and his cousin supervised pit bosses in Las Vegas before they joined the business in the late 1990s. At that time, Baileyana was a small brand started by Catherine Niven from a 3 1/2 acre vineyard planted in front of their Edna Valley home. A big part of the vineyard business was supplying grapes to Edna Valley Vineyard, a 50-50 partnership the family had with the Chalone Wine Group. The Nivens provided grapes and Chalone made the wine and marketed it on a large scale. John and his cousin took on the job of repositioning Baileyana as a larger, national brand. The family remodeled a century-old, one-room schoolhouse that became the tasting room, and Roguenant was given the resources to build his dream winery on vineyard property. The Firepeak parcel was added to Paragon Vineyard and, in 2005, the Nivens began launching a series of brands from their estate winery. In 2011, the family sold its share of Edna Valley Vineyard, something it never intended to do, John H. Niven said. Diageo, the corporate partner that acquired Chalone, decided to sell its 50 percent holding. The Nivens tried to find another partner, but companies that could handle large-scale distribution were not interested in sharing ownership, so Edna Valley was sold to Gallo. The Nivens continue to sell grapes to the label, amounting to nearly half of Paragon’s annual harvest. • Baileyana: Estate chardonnay, pinot noir and syrah. • Tangent: Alternative whites, which include sauvignon blanc, albariño, pinot gris, viognier and grenache blanc, all unoaked. • Trenza: Blends of Paso Robles reds with cool climate reds from Edna, Arroyo Grande and Santa Maria valleys. • Cadre: Reserve small-production pinot noir. • Zocker: Riesling and a well-received experiment with grüner veltliner, rarely grown in California but common along Germany’s Danube River. The wine is full-bodied with good acidity and the minerality of a pinot gris, Roguenant said. • True Myth: Edna Valley chardonnay and Paso Robles cabernet priced for everyday drinking. Niven said it is the future of the company and its most ambitious project to date, with production at 60,000 cases. Sourcing almost all from the estate allows the family to control its destiny, Roguenant said. “Financially, it’s a much better model. And the fact that we can farm to make the best wine changes everything,” he said.